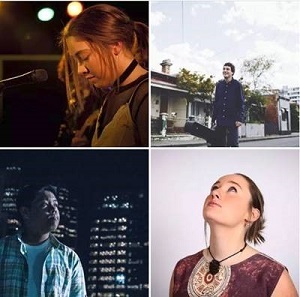 The Real Songwriters of Melbourne presents their sixth Real Songwriters Live showcase. To be held on Saturday October 13 at iconic music hub, Wick Studios. Real Songwriters Live gives artists a chance to get themselves out there in the Melbourne music industry by showcasing their original work to a new, eager and intimate audience. RSOM are proud to announce Amithest, Arzenn, Louis & Tyller as the four artists featuring in this year’s campaign. These four artists have been individually picked by the RSOM Team and will join many RSOM Alumni including Rya Park, Essie Holt, James Franklin, NYUON and more. The artists will be featuring in a media campaign organised by the RSOM PR Team which will help artists learn more about the business side of putting on an event. For some, it may be their first radio interview and for some, it may be one of their first performances. The campaign endeavours to equip artists with knowledge that will help them further themselves in their careers. TICKETS VIA EVENTBRITE $20 + BF.